New commitments in July once again exceeded 100 million lbs. Only 222 million lbs. remain uncommitted from the 2013 crop supply, indicating shortages until the new crop is harvested. Ending inventories to carry into next year project to be 330-345 million lbs. The 2014 crop harvest will begin in earnest in early August, 10-14 days ahead of last year. 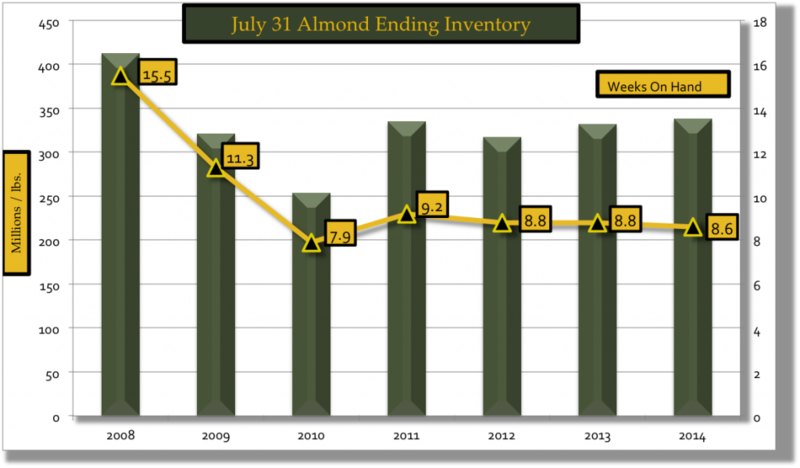 The growth in almond consumption continues to be widespread globally. The U.S., Europe, and Middle East/Africa markets all continue to be up 10% or more YTD. Only the Asia/Pacific region declined this year. However, in June, shipments bound for both India and China increased over last year, contributing to 20% growth in June. California almond growers are concerned that the 2014 crop may not yield the full 2.1 billion lbs. projected by the NASS Estimate. As a result they have been slow to begin selling the 2014 crop. Even with a full 2.1 billion lb. crop, ending inventory projections continue to decline relative to expanding global consumption (see chart below). The July 31st ending inventory will represent less than a 60-day supply. Many growers look at the 2015 crop yield outlook as potentially more impacted than the 2014 crop, pending upcoming seasonal rainfall totals. Market prices for 2013 crop are firming as supplies dwindle. 2014 crop prices have begun inching upward as buyers assess the supply outlook with the Objective Estimate in hand. The June shipment numbers will only strengthen that viewpoint. The projected 2014 crop will supply early season demand. 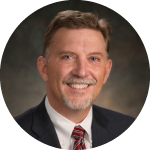 Given the outlook, ingredient users would be prudent to assess the risk and reward of securing their crop needs earlier, rather than later in the season.